Lately I've been feeling leggings. How else does one mend a broken heart but to just straight not put real pants on? If you know a different way, I am open to suggestions, but this has been working wonders. It's all fine and dandy until you realize you haven't put on a pair of "real" pants in over a week. One day I tried and then thought to myself..."Well this is rather uncomfortable so what the heck am I doing!". And that ended that rather quickly. You know it's probably time to put some "real" pants on when one of your friends mentions.."Hey! you don't have leggings on!"... Because you had to put every pair you own in to the wash...so you upgraded(ha!) to jeggings. What a ridiculous girl I am being. But you know what? Hearts take time to mend. To heal. To feel ok again. So you do what you have to do! Which is...all the typical mend my broken heart things of course...Far too much chocolate. For breakfast might I add. A little retail therapy which is of course completely necessary. Got my hair did...fresh start you know? And straight up leggings for over almost two entire weeks. I have however been avoiding chick flicks and sappy love songs. Those my friends are just a recipe for disaster. Yup. I'd say my heart is just about all healed up. So who wants to set me up on a date? Kidding. But seriously...I promise not to wear leggings. haha! Love you! Thursday- no leggings (at least not after 5 o'clock)! I loooove those leggings. I want them all! I'm glad you're healing. You're adorable. Love leggings and I love these looks! I haven't ventured out into the printed leggings but after seeing those, I just might. Super cute. I want to set you up on a date. I've been wanting to for months. If you're serious, I'm serious. Girl, you are the cutest!! :) I love how you styled these! :) so fun! 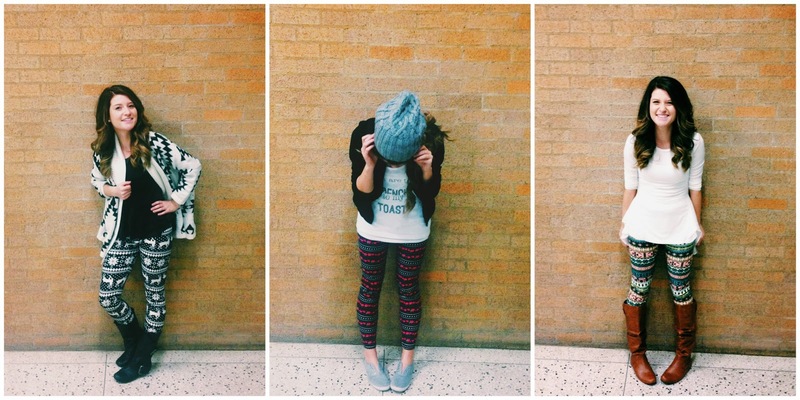 love your blog, love your leggings, love your gypsy spirit. glad you're feeling better!